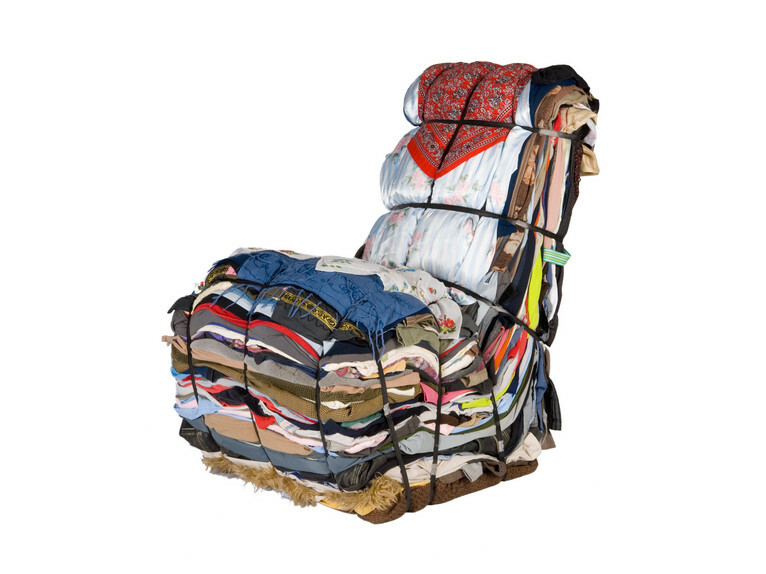 Image: “Rag Chair” by Tejo Remy, available at droog. Economic recession has become the excuse of the year – businesses have closed, people have lost their jobs, supplies are limited, recent college graduates and tenured professionals alike are scrambling for ways to pay the rent. With any luck, the recently approved economic recovery package will encourage long-term growth, but it won’t be easy, and it probably won’t happen fast. So, how can this all be put into perspective? As in earlier depressions and recessions, designers, celebrities, and regular people are recycling and innovating with items they already have. Take a look at recessiondesign.com. Founder Rick is advertising straightforward, flat rates for his services labeled with cheeky names like “sausage roll” (logo design, £50), “steak bake” (five-page website hosted for one year, £175), or “iced finger” (guerilla campaign including logos, website, and direct mail service, £500). Using food types to label levels of service sounds more basic, even necessary, than formal listings for graphic design and advertising. Oprah’s Favorite Things for the 2008 holidays, usually a list of the latest fancy gadgetry, included homemade projects and sentimental gifts. The queen of television’s favorite homespun idea was the “Gratitude Box,” a gift adaptable to any holiday or gathering, featuring sentimental notes to be added to boxes decorated to fit the personality of the gift recipient. For a minimalist, this idea sounds a bit cluttery or even wasteful, but it is adaptable once incorporated into any number of useful items. Imagine the decorated box as storage container or cookware; it could even morph into a decoration like a garland, or, for the larger budget, a light fixture like Ingo Mauer’s Zettel’z Ceiling Lamp can do the trick. Ann Porter of KitchAnn Style also brings recession decoration and design back home. After quoting trend analyst Faith Popcorn, Ann goes on to discuss the importance of reusing furniture, objects, and fabrics, incorporating them into new room styles rather than disposing of the old and refurnishing. The flavor of terms like “heirloom” and “resurfacing” reignite the value of items earlier considered junk. Bric-a-brac and ill-fitting dresses become the parts of new lamps and throw pillows. Relate this to the successes of Readymade or Craft Stylish magazines or even droog products. On the same subject, The Guardian’s “Observer”, Stephen Bayley, in his January 11th post, perfectly points out how past times of constraint have triggered progress in design and architecture. He lists Raymond Loewy, Henry Dreyfuss, and Norman Bel Geddes among the innovators who were able to persuade consumers to want more from less, working with what was available. With the smooth, undecorated, and streamlined objects arrived an impression of life unfettered and less consumptive, disguising the budding of purchasing power. Innovation of material re-combination and new alloys contributed to less costly methods and new perspectives on what design should do. It’s important to remember how historically low economic times have brought about great, new ideas. Although times are difficult and challenging, all chins can be lifted by the resurgence of making the most with what is handy, reinventing the old. It’s time to get back to the drawing boards, search the thrift shops, toil at computer screens, and hunt through storage containers and even dumpsters to find inspiration that will entice the nation. Everybody else is doing it, so why aren’t you? This entry was posted on February 16, 2009 at 10:19 pm and is filed under Economy, Recession. You can follow any responses to this entry through the RSS 2.0 feed. You can leave a response, or trackback from your own site.